Sometimes I struggle with a short attention span due to some cognitive challenges resulting from Multiple Sclerosis. My form of Multiple Sclerosis comes and goes. A symptom appears, gets worse for a period of time, then gets better for a while and finally I will have some permanent damage. Over time, I have begun to realize this as a blessing from God, so I can better understand and help my youngest son, Clay, who has Attention Deficit Disorder. My husband, two older sons, and I are all logical, linear thinkers who have had a great deal of trouble understanding Clay because he was so different than the rest of us. We love his creative, artistic side but grieved with him as he struggled in school over the years. Now Clay and I try to help each other come up with coping strategies to work through our challenges. 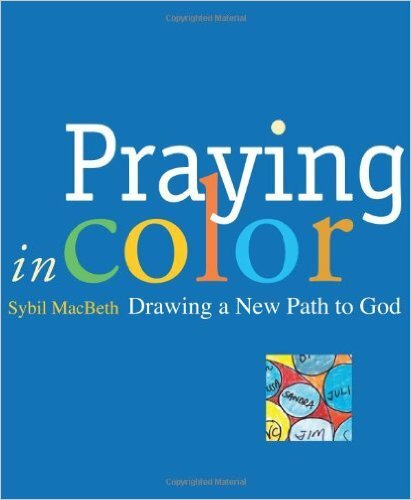 A few years ago, when I was in one of these challenging periods of short attention, I discovered a wonderful resource I have used ever since, Praying in Color, Drawing a New Path to God by Sybil Mac Beth. It is a great way for me to pray and doesn’t require any artistic ability. This is a very good thing because I don’t have any artistic ability! I start by asking God to bless my time and give me the needs of each person for which I will be praying. Then I put down their first name somewhere on the page. I draw a shape around the name and another further outside that shape. I continue until I have listed all the names of the people for whom I want to pray. Next, I add detail and color. 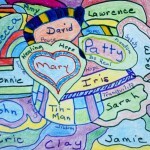 This can take a long time, and while I am doing it I am praying about the people as I color. It’s a very automatic, natural way to pray. I am thinking about them as I color about them. If a word comes to my mind, I incorporate it in the picture by their name. 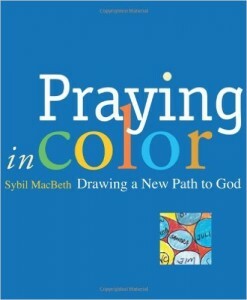 I’m amazed how God used my weaknesses to find a unique life giving rhythm centered on praying in color. It has drawn me closer to Him in ways I never expected, revealing great joy in my soul and in the prayers created for Him. Did this experience bring me closer to God today? Did I allow this experience to still my mind enough to let God in? What messages did God have for me today? God, please bring me your peace, love and tranquility today so I may not allow distractions to crowd out your loving voice. Amen.